The Code Blue emergency winter response for people sleeping rough is once again in effect, due to forecast very cold overnight conditions. Housing SA, together with its non-government partners, is making additional accommodation available for extended hours tonight (Tuesday) and tomorrow (Wednesday) night. In the Adelaide CBD, the Hutt St Centre, 258 Hutt St, will remain open until 7am on Thursday 8 June to provide shelter from the cold to people sleeping rough. to emergency accommodation and other supports. For information on emergency accommodation available across the state call the 24/7 SA Homelessness Gateway on 1800 003 308. The Code Blue ensures there is shelter available for rough sleepers during extreme weather conditions, such as storms, severe cold and heavy rain. Outreach services like Street Crew in the CBD will also be connecting with people sleeping rough. 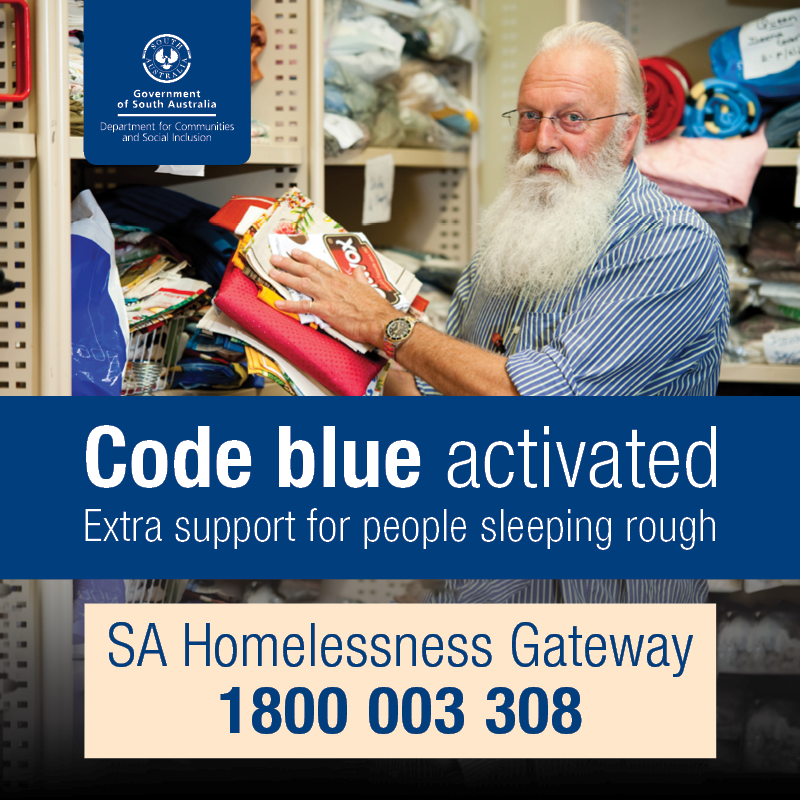 Code Blue was activated statewide for the first time from 1-2 June, and again on 3-4 June.